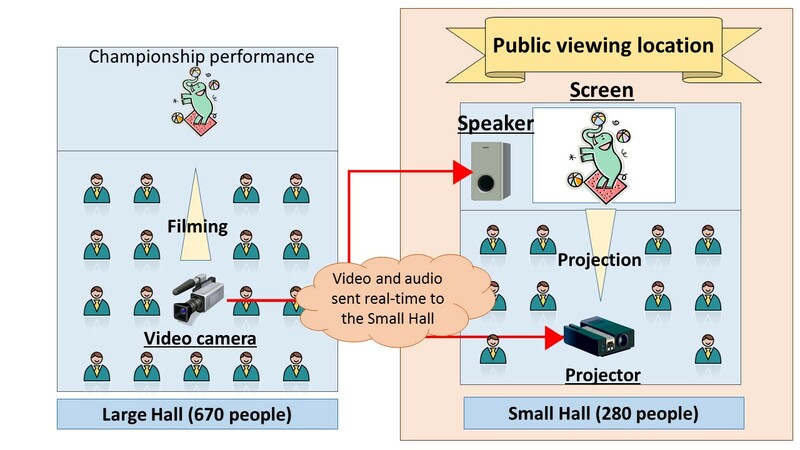 While the 2014 Championship will be held in the Large Hall, a public viewing has been arranged so that the event can also be viewed remotely in real time in a separate hall (Small Hall) in order to allow more participants to see the event. The price of the public viewing in the Small Hall is 500 yen, a saving of 1500 yen from the price of viewing the championship live in the Large Hall (2000 yen). In addition, it is possible to get a close view of the performances due to the large screen. Both options are available during the registration process, so please choose the option most suited to you. The concept of the public viewing is shown below. * The schedule is planned to match that of the Large Hall, however this may change due delays in preparation.